La Bisbal d’Empordà is now one of the leading pottery centres in Catalonia. 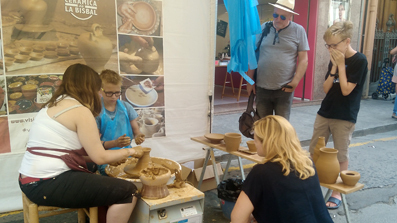 The importance of this activity is clearly shown in the urban landscape of the city, known for the slender silhouettes of old industrial chimneys and a shopping area that is focussed on marketing the different pottery products. La Bisbal d'Empordà has many cultural activities and services so all visitors can enjoy the city from its many different points of interest: crafts, shopping, ceramics, heritage sites, fairs and markets, antiquities, castles, history, etc. Enjoying the pleasure of visiting La Bisbal also means enjoying the pleasure of its cuisine. La Bisbal offers a wide range of gastronomic possibilities, from homemade traditional cuisine to seasonal food, together with the excellent quality of its bakeries. La Bisbal offers you a comprehensive and varied range of accommodation in the town and its surroundings: hotels, guest houses, accommodation in the country and summer camp houses. Promotional video of the city, discover all its corners. 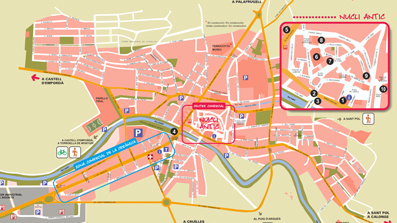 Download the map of the city and enjoy the visit. Please leave your opinion, which we will take into consideration.